The Staff (or Rod) of Asclepius is a symbol of ancient Greek mythology. It is formed with a winged staff in the middle with a single staff ascending it. In Greek mythology, the Staff was wielded by the Asclepius, the god of healing and medicine whose name actually translates to mean “to cut open”. According to legend, Asclepius was cut from his mother’s womb while she burned because of infidelity to her husband, the formidable Apollo. Because of this and the previously mentioned reason, temples dedicated to healing are named after this god, called asclepieia. 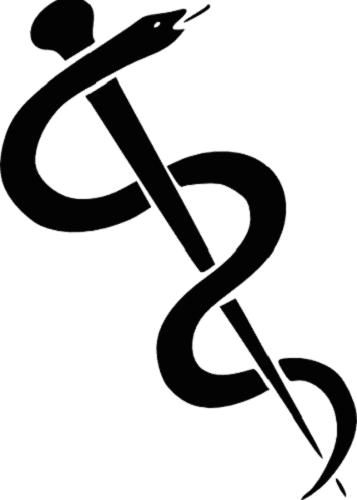 As such, the Staff of Asclepius symbol is often used as a symbol of healthcare, medical practice, and surgery, particularly in North America. Furthermore, we can commonly see this symbol donned by physicians due to the story of Hippocrates, the legendary physician, and his involvement with Asclepius. According to the story, Hippocrates invoked the blessings and skills of Asclepius in order to provide the purest and most efficient form of healing to his patients. It is from this that the Hippocratic Oath was formed. In fact, physicians swearing this oath are sometimes required to swear upon the name of Asclepius to provide healing and care with the highest degree of integrity. The Staff of Asclepius symbolism is similar in appearance to the caduceus, and the two are often mistaken for one another. However, they are distinctly different. 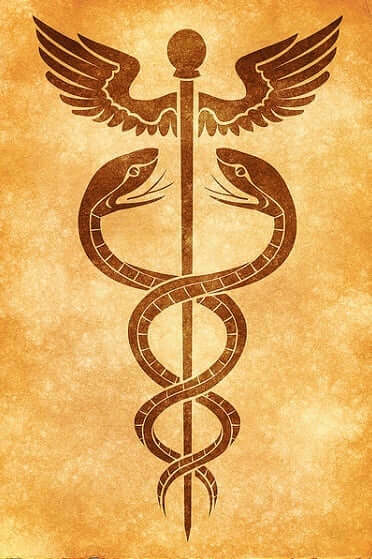 The caduceus is a winged staff with two snakes wrapped around it, while the Staff of Asclepius only has a single snake and no wings. Since they are made up of the same components, though, we can see that the Staff of Asclepius and the Caduceus meaning share some similarities. The separate entities that compose the Staff of Asclepius each come with their own symbolism. The staff is traditionally phallic in nature, and thus has strong masculine tendencies. The snake spiraling around it was placed that way with purpose. This weaving and contorting nature refers to the expansion of our knowledge, wisdom, and mind in general. In addition to its positioning, the snake symbolism has its own importance. Snakes were often used in healing rituals and procedures by many groups, including the ancient Greeks. Both venomous and non-venomous ones were used. This was because their bodily fluids were believed to have medicinal purposes. Also, snakes shed their skin, which was interpreted as ridding itself of illness and other detriments. This added renewal to the list of symbolism connected with the staff. The last component of the caduceus, wings, speak wonders as far as symbolism is concerned. Like birds, wings are symbolic of ascension. They encourage us to set our sights high for ourselves and soar to achieve our goals. Wings also symbolize divine messages for a higher awareness. More literally, wings are a mode by which things are able to travel, which ties back into the stories of Hermes and Mercury the messengers. In addition to healing, integrity, rebirth, and a wide variety of both general and specific medical qualities, the Staff of Asclepius symbol can more generally be considered as an emblem of faith and life. As it is a symbol of a higher power deity, we can understand how faith would come into play. In ancient times (and even sometimes during the modern day), people who were ill would rely heavily on faith and prayer to ensure that their loved ones or themselves would pull through. Anything associated with any of the deities, no matter how big or how small, would have been considered sacred to the Greeks, as well. They understood and respected things that were bigger than themselves and remind us that we need to do this, as well.